The past fifteen years has seen the Red Hot Chilli Pipers become the most famous bagpipe band on the planet… ever! Bagpipes with attitude, drums with a Scottish accent and a show that carries its own health warning. In 2014, The Chilli Pipers released a new live DVD and CD entitled `Live at the Lake`. 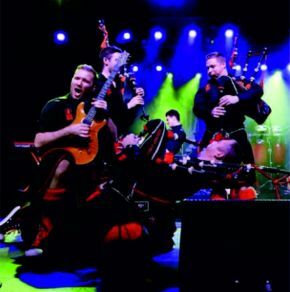 In an explosive evening of entertainment captured on this live DVD and CD, The Red Hot Chilli Pipers recorded their most adventurous project to date, bringing 16 musicians and dancers across the Atlantic to perform at Milwaukee Irish Fest, the spiritual home of the band in the USA. They captured the unique and explosive power of the Chilli Pipers in one unforgettable evening by the shores of Lake Michigan. Tracks include .Insomnia, Gimme All Your Lovin', Thunderstruck, Everybody Dance Now, Amazing Grace, Fix You, Chasing Cars, Wake Me Up, Don’t Stop Believin and We Will Rock You. In 2018 The Red Hot Chilli Pipers will continue their World Tour with stops in the UK, USA, Germany, Hong Kong, Ireland and many more, check the Band´s website for regular updates. Gold disc for over 100,000 UK sales of their first album - `Backrock to the Masses‘. To date, The Red Hot Chilli Piper have performed live to over 1 million people. Triple platinum status for the album and DVD - `Blast Live`. Awarded twice for `Best Live Act in Scotland`. Over 3.5 million on Youtube of their viral cover of the Avici track `Wake me up`. Sell out gigs and tours in USA, China, Australia, Germany, Switzerland and Australia. Winner of the BBC TV prime time talent show `When Will I be Famous` hosted by Graham Norton. A Big Hearted Scotland nomination for their charity work. Performances at BBC Proms in Hyde Park, T in the Park, Wacken Open Air Festival. Performances at major sporting events including NBC Olympics Studio and the Rugby World Cup. Performances for major stars including Ewan McGregor, Paul McCartney, Sir Alex Ferguson, Gary Player, The Scottish Rugby Team, Her Majesty The Queen and Samuel L Jackson.